What makes Ruby on Rails the best bet for Startups in 2019? If you are a startup organization, and want to create a web application, there are probably hundreds of programming languages and a plethora of web app development frameworks to choose from, and making the choice that best suits your business needs could prove to be a challenge. Nevertheless, making that right choice is going to make all the difference in terms of factors such as saving money and time without compromising on security factors. And considering these factors, we could safely say Ruby on Rails is the best choice for your startup. To begin with, Ruby on Rails or RoR is extremely startup-friendly as it is known for its flexibility, scalability, and security. 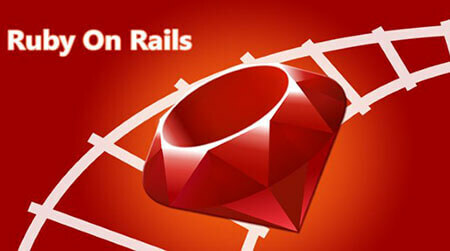 Rails is a model-view-controller (MVC) server-side web application framework written in Ruby, and since its introduction in 2005, it has greatly influenced web app development through its many innovative features. In fact, the influence of RoR on other web app development frameworks is quite apparent, with many frameworks written in other programming languages borrowing its ideas, like Django in Python, Laravel in PHP, and Sails.js in Node.js to name a few. Two of the major challenges faced by startups are budget and time constraints. They have to finish off their project with a thin financial backing and launch their product as soon as possible. RoR is an open-source framework that runs on Linux, which is again a family of open-source software operating system and hence is completely free. Also, there’s plenty availability of plugins for Ruby, which the developers can make use of and save time, which would otherwise be wasted on unnecessary coding. These factors add to RoR being a sensible and viable choice for startups even if working on a shoestring budget. Scalability is the ability of your web application to handle the extra load as your user-base increases, sometimes even exponentially, and this is an important factor that all startups must consider. And when it comes to RoR, there has always been a debate over its scalability. This began with Twitter changing from RoR to Scala as their user-base increased. Nevertheless, all arguments can be put to rest when one realizes that Shopify was built on and still runs on advanced RoR. The official website of Shopify says that the website now handles more than 4 million requests per second. How is that for a counter argument? So we can safely conclude that no one needs be skeptical about the scalability of RoR. Yet another challenge faced by startups is the flexibility of a web app platform to make modifications in future as and when new requirements arise. The stability and predictability offered by RoR make it a very flexible web app platform. With RoR, it’s easy to modify the existing codes or add new features to the site. RoR lets you make any modifications to your app at any point in time in the future, even if the team of developers who initially built your app is no longer available. This is because RoR follows coding conventions that make it easy for a new team of developers to start working from where the old team has left it. 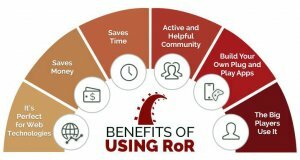 In fact, RoR has one of the most active and vibrant communities in the world of web app development frameworks. The many thousands of developers from around the world enthusiastically contribute to the libraries of RoR. This is very helpful for a startup as this lively community can help address any roadblocks that come in the way of your project. Also, it has been proven time and again that the many ready-made and reusable components freely and easily available to developers from the RoR libraries makes building applications about 30-40% faster than using other programming languages or frameworks. RoR has many built-in security measures that are enabled by default. Also, the RoR community tests all the components before release, adding to the security of the framework. Besides, RoR encourages both test-driven development (TDD), and behavior-driven development (BDD). All these make RoR work on clean and secured codes and hence is a great way for bug-free development. RoR is particular about testing and test automation. This allows RoR developers to test the codes before implementing without the help of any third-party testing tools. RoR is all about clean and efficient coding, and the ‘gems’ or components that come along with the framework allows web app development companies to improve their coding style, test codes and debug it on short notices. All this makes RoR easy to support and maintain. RoR is a full-stack framework that’s well suited for all types of industry verticals including CMS, e-commerce, FinTech, social network and more. The Ruby language is quite eloquent and concise, and when combined with the many available third-party libraries, enables you to develop features incredibly fast. This makes RoR on of the most productive programming languages for developers. Why Spericorn is good for your RoR development project? Spericorn is one of the best Ruby on Rails development companies that believes that the best ingredients for a quality project are innovation, expertise, dedication, and transparency. As a responsible RoR development company, we consider it our top precedence to put cent percent efforts in delivering each of our projects. Our clients are our top priorities and we strive to put a smile of satisfaction on every client we hold business with. You can hire our Ruby on Rails developers for any of your small-sized projects, or entrust us with providing solutions for larger projects. We are veterans in Ruby on Rails development and we cater to the web app development needs of our clients through innovative features such as seamless database table creations, migrations, and scaffolding of views to enable rapid application development. Following the Ruby on Rails development’s principles of ‘Convention over Configuration’ (CoC) and ‘Don’t Repeat Yourself’ (DRY), we focus on providing you with solutions at a faster pace with fewer codes and less repetition. I simply want to mention I am newbie to blogs and absolutely enjoyed this website. Almost certainly I’m likely to bookmark your blog. You certainly have awesome articles. Regards for sharing your blog.